U.S. Army medical examiners were suspicious about the close proximity of the three bullet holes in Pat Tillman's forehead and tried without success to get authorities to investigate whether the former professional football player's death amounted to a crime, according to documents obtained by The Associated Press. "The medical evidence did not match up with the scenario as described," a doctor who examined Tillman's body after he was killed on the battlefield in Afghanistan in 2004 told investigators. The doctors — whose names were blacked out — said the bullet holes were so close together that it appeared the Army Ranger was cut down by an M-16 fired from a mere 10 yards or so away. The Pentagon and the administration of President George W. Bush have been criticized in recent months for lying about the circumstances of Tillman's death. The military initially told the public and the Tillman family that he had been killed by enemy fire. Only weeks later did the Pentagon acknowledge he was gunned down by fellow Rangers. Ultimately, the Defense Department did conduct a criminal investigation, and asked Tillman's comrades whether he was disliked by his men and whether they had any reason to believe he was deliberately killed. The Pentagon eventually ruled that Tillman's death at the hands of his comrades was a friendly-fire accident. The medical examiners' suspicions were outlined in 2,300 pages of testimony released to the AP this week by the Defense Department in response to a Freedom of Information Act request. A news video that aired on Thursday's CBS Evening News on the Pat Tillman investigation erroneously included a picture of ret. Brigadier Gen. Gary Lee Jones. Gen. Gary Lee Jones is not connected in any way to the Tillman investigation. CBS News regrets the error. In his last words moments before he was killed, Tillman snapped at a panicky comrade under fire to shut up and stop "sniveling." Army attorneys sent each other congratulatory e-mails for keeping criminal investigators at bay as the Army conducted an internal friendly-fire investigation that resulted in administrative, or non-criminal, punishments. The three-star general who kept the truth about Tillman's death from his family and the public told investigators some 70 times that he had a bad memory and could not recall details of his actions. No evidence at all of enemy fire was found at the scene — no one was hit by enemy fire, nor was any government equipment struck. With questions lingering about how high in the Bush administration the deception reached, Congress is preparing for yet another hearing next week. The Pentagon is separately preparing a new round of punishments, including a stinging demotion of retired Lt. Gen. Philip R. Kensinger Jr., 60, according to military officials who spoke on condition of anonymity because the punishments under consideration have not been made public. In more than four hours of questioning by the Pentagon inspector general's office in December 2006, Kensinger repeatedly contradicted other officers' testimony, and sometimes his own. He said on some 70 occasions that he did not recall something. At one point, he said: "You've got me really scared about my brain right now. I'm really having a problem." Tillman's mother, Mary Tillman, who has long suggested that her son was deliberately killed by his comrades, said she is still looking for answers. "Nothing is going to bring Pat back. It's about justice for Pat and justice for other soldiers. The nation has been deceived," she said. The documents show that a doctor who autopsied Tillman's body was suspicious of the three gunshot wounds to the forehead. The doctor said he took the unusual step of calling the Army's Human Resources Command and was rebuffed. He then asked an official at the Army's Criminal Investigation Division if the CID would consider opening a criminal case. "He said he talked to his higher headquarters and they had said no," the doctor testified. Also according to the documents, investigators pressed officers and soldiers on a question Mrs. Tillman has been asking all along. "Have you, at any time since this incident occurred back on April 22, 2004, have you ever received any information even rumor that Cpl. 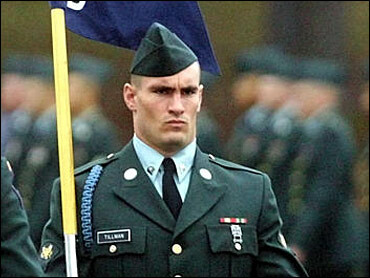 Tillman was killed by anybody within his own unit intentionally?" an investigator asked then-Capt. Richard Scott. Scott, and others who were asked, said they were certain the shooting was accidental. Investigators also asked soldiers and commanders whether Tillman was disliked, whether anyone was jealous of his celebrity, or if he was considered arrogant. They said Tillman was respected, admired and well-liked. The documents also shed new light on Tillman's last moments. It has been widely reported by the AP and others that Spc. Bryan O'Neal, who was at Tillman's side as he was killed, told investigators that Tillman was waving his arms shouting "Cease fire, friendlies, I am Pat (expletive) Tillman, damn it!" again and again. But the latest documents give a different account from a chaplain who debriefed the entire unit days after Tillman was killed. The chaplain said O'Neal told him he was hugging the ground at Tillman's side, "crying out to God, 'Help us.' And Tillman says to him, 'Would you shut your (expletive) mouth? God's not going to help you; you need to do something for yourself, you sniveling ...'"